This time around Jolie has been replaced by Alicia Vikander, who like her predecessor stepped into Lara Croft’s shoes shortly after winning a Best Supporting Actress Oscar (Jolie for Girl Interrupted and Vikander for The Danish Girl). Her Lara is a young woman who’s fiercely intelligent and smart, but whose life shifted sideways when her adventurer father went missing, presumed dead, when she was a child. Unwilling to accept that he’s dead, Lara’s drive to find out what happened to her dad kicks into high gear when she uncovers his research and information about exactly what he’s gone off to look for. Lara heads off to Asia, teaming up with a literal drunker sailor, Lu Ren (Daniel Wu), to try and find the truth. Soon she’s come into the sphere of the evil Mathias Vogel (Walton Goggins), who may not only have information about what happened to Lara’s dad, but is also trying to complete his mission to find the tomb of Himiko, a supernatural being said to be able to kill with the touch of her hand. Warner Bros/MGM was obviously hoping this was going to be the beginning of a blockbuster franchise, but like so many videogame-to-movies before it, the film’s okay but nothing particularly special. Efficient would probably be the best way to describe it. It suffers from many of the problems of modern action blockbuster. For example, the action sequences are pretty good, but it becomes increasingly clear that the idea for the setpiece came before the reason for it. The script never properly finds a way to make them feel intrinsic to what you’re watching, so that while on their own they’re well put together, many also feel oddly arbitrary. That in turn highlights the fact that the movie hasn’t quite worked out what it’s for, other than filling a couple of hours of screentime. You also have a rather odd situation where it feels like director Roar Uthaug told Alicia Vikander and Daniel Wu that they should take the whole thing seriously and give committed and engaging performances. However, he then told Dominic West and Walton Goggins to chew the scenery so hard they’re constantly spitting plasterboard. Goggins in particular drew the short straw, as he was given a character that almost demands moustache-twirling and hamminess. He might as well have just had the word ‘Evil’ tattooed on his forehead. The result is that Vikander is luminous, bringing the whole thing to life, but is constantly hamstrung by an uneven script and too many elements that are either lazy, overly convenient or cliched. Even so, she does enough to ensure that Tomb Raider is surprisingly watchable. She also makes me think that if they did make a sequel, with a little more care it could be really good, especially with her in the lead. In the end though we have a film I’m not upset I had to watch, but will almost certainly never feel the need to watch again. 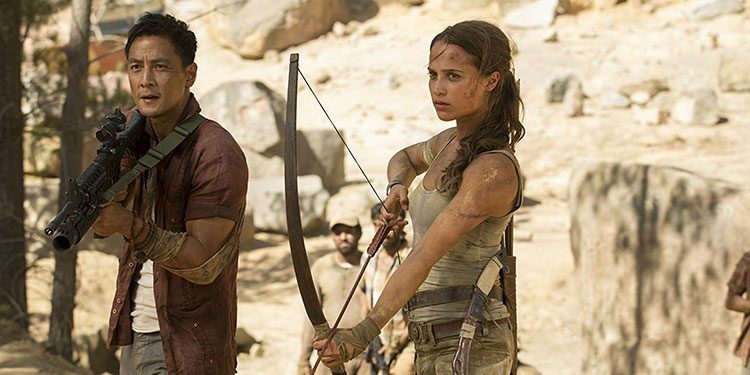 There are a few decent featurettes on the Blu-ray, looking at things such as the evolution of the character of Lara Croft (with Jolie’s incarnation conspicuous by its absence) and the intensive training Alicia Vikander underwent to prepare her for the all-action role. The HD picture is also largely good, although the darker scenes are perhaps a little too dark to the point it’s sometimes a little difficult to see what’s happening. Overall Verdict: Alicia Vikander is great, bringing real vigour and humanity to a role it would have been easy to turn cartoonish. However the film around her offers efficient action but keeps falling down elsewhere.